Don't get bogged down—learn why peat is the "forgotten fossil fuel." Bogs have traditionally been harvested for peat, a fossil fuel used for heating and electrical energy. 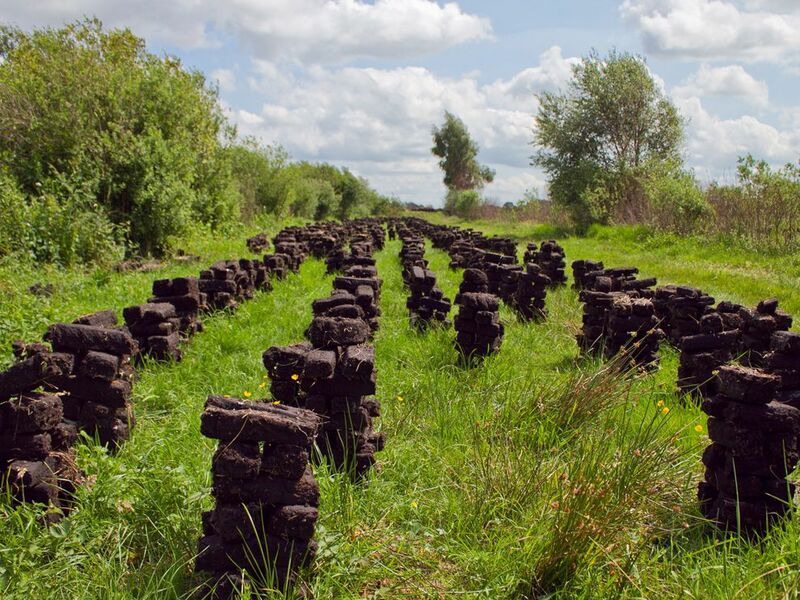 These stacks of peat (also called turf) have been harvested from a bog in Ireland. They will be dried and sold as bricks for heating. Peat is the "forgotten fossil fuel." While oil, coal, and natural gas are exported around the world, few outside northern Europe are aware of this energy source. In certain circumstances, peat can be an early stage in coal formation. Most of the time, however, peat is a unique material. Peat forms in bogs. Bogs are a type of wetland with a high acid content. Like all wetlands, bogs are inhabited by marshy plants, including trees, grasses, and moss. The bog's acidity prevents this vegetation from fully decaying. This partly-decayed organic material builds up in bogs. Over millions of years, it becomes peat. Wet bricks of raw peat are pressed to force out water. The bricks are then dried further, using heat or pressure. The bricks are then used as fuel, mostly for heating homes and businesses. Northern Europe, particularly Scandinavia and the British Isles, have the most peatlands harvested for fuel use. However, peat bogs can be found from Tierra del Fuego to Indonesia. Finland, Ireland, and Scotland are the biggest consumers of peat as a fuel. wetland of soft ground made mostly of decaying plant matter. wetland bog from which peat has been removed by hand or industrial means. Also called a cutover bog. granular particles of peat scraped from the surface of a bog and mixed with other materials by special machinery. group of islands at the southern tip of South America.